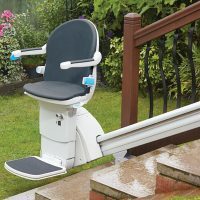 The slimline aluminium track has a hidden rack with two park points, so the battery can be charged at the top or bottom of the stairs. 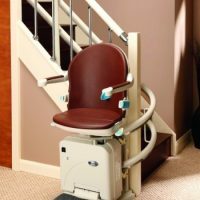 The Smart Seat is available in a choice of six upholstery colours, and has optional powered features to swivel the seat at the top of the staircase or fold the footplate after use. 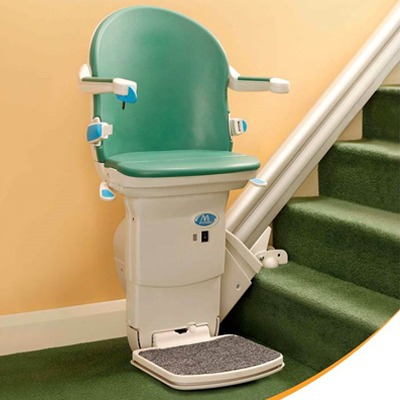 The Handicare 1000 can also be combined with a powered hinge solution to prevent the track from obscuring any doorway at the base of the stairs. 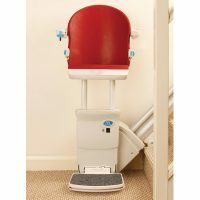 The Handicare 1000 also comes in XL and XXL models which offer the heaviest weight capacities (see details below), while both the XL and XXL are supplied with additional arm spacers to increase the distance between arms. Upholstery is available in a choice of six different colours; sand, slate, cocoa, jade, sapphire and ruby PU finish. 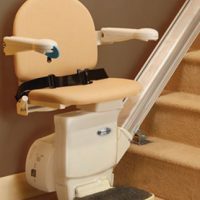 Just contact us for a quote and more information on our stairlift service.